Net loss INR 65.2 crore. Excellent work in reducing unit costs in Q2’16, exceeded expectations. Accumulated losses around 200 crore, losses since start of operations around INR 150 crore. Financial & certain performance data reported by AirAsia India is inconsistent, inaccurate, and unreliable. The quarter report for Q1’16 (“SECOND QUARTER REPORT ENDED 30 JUNE 2015”) states that in Q1’15, AirAsia India reported a net loss of RM 0.4 Million. However, the quarter report for Q1’15 (“SECOND QUARTER REPORT ENDED 30 JUNE 2014”) states that AirAsia India reported a net loss of RM 13.8 Million. This translates to a difference of RM 13.4 Million / INR 25.9 crore. The quarter report for Q4’15 (“FIRST QUARTER REPORT ENDED 31 MARCH 2015”) states that in Q4’14, AirAsia India reported a net loss of RM 12.4 Million, which, based on the RM-INR conversion rate prevalent then, converts to INR 22.7 crore. However, the P&L statement in the same Q4’15 report states that AirAsia India had a net loss of only INR 8 crore. The quarter report for both Q2’16 (“THIRD QUARTER REPORT ENDED 30 JUNE 2015”) and Q2’15 (“THIRD QUARTER REPORT ENDED 30 JUNE 2014”) states that in Q2’15, AirAsia India recorded a net loss of RM 15.7 Million, which converts to INR 29 crore based on the RM-INR conversion rate prevalent then. However, in the Q2’16 report, AirAsia India is stated as having incurred a net loss of INR 52.9 crore. The flown capacity (ASK) reported by AirAsia India in its quarterly reports is 12%, 5% and 3% higher than what the airline has reported to the DGCA in Q2’16, Q1’16, and Q415. However, in teh two sources of data, the number of flights by the airline match perfectly, and the number of passengers flown are reasonably close. As a result of (3), we will refrain from comparing Q2’16 data with Q2’15 data, but will only compare Q2’16 data with Q1’16 and Q4’15 data. As a result of (4), we will refrain from using the AirAsia India flown capacity as reported in the quarterly reports, as this leads to very misleading performance numbers. We stick to the DGCA data. We had already mentioned the first three points, but the discovery of issue (4) made us withdraw our earlier analysis and revise the numbers. This is the revised analysis. Due to the ambiguity resulting from points (1), (2) and (3) above, the total losses accumulated by AirAsia India including Q2’16 is around INR 200 crore. Total losses since start of commercial operations (ignoring June 2014) stands at INR 150 crore as reported by AirAsia India. Q2’16 (July 01st – September 30th, 2015) was AirAsia India’s first full quarter of 5 aircraft operations. In this period, the airline flew 416,182 passengers (excluding no shows: 401,905. No shows : 3%), which is a 38% rise compared to Q1’16, though the number of flights increased by 50%. This explains Q2’16’s load factors of 76%, as against Q1’16’s load factors of 83%. The load factors in Q2’16 were lower than the 79% witnessed in the other lean season – Q4’15. Load factors include no show passengers. The airline operated 34 daily flights as of 30th September 2015, and flew its millionth passenger in the first half of August 2015. Q2 is historically a lean season. Capacity in Q2’16 grew by 56% over Q1’16, despite flights increasing by only 50%. This is in line with the average stage length of each flight increasing to 1,208 km/flt from 1,146 km/flt. Low load factors, increase in average stage length, and the low pricing power in the lean season have together resulted in the average fare dropping to INR 2,684 in Q2’16 from INR 3,350 in Q1’16. In Q2’16, AirAsia India did not inaugurate any new routes, but added a frequency on the Bengaluru – Vizag sector, and hence, there was no significant effect of low yields due to new routes. Ancillary revenues at the airline have picked up very well. From being just 8% of total revenue in Q4’15, to 10% in Q1’16, it touched 15% in Q2’16. This has been aided by the increase in cargo per flight, to an average of 1,205 kg per flight in Q2’16 compared to 1,074 kg/flt in Q1’16 and 971 kg/flt in Q4’15. However, on a unit basis, the airline’s revenue per available seat kilometre (RASK) suffered a 27% drop from Q1’16 figures, to settle at INR 2.22/seat-km, due to the factors mentioned in the preceding paragraphs. The unit revenues are 22% lower than the Q4’15 lean season. AirAsia India’s cost performance is very good, and has touched record low values in Q2’16. Unit aircraft fuel expenses fell by 13% in Q2’16 compared to Q1’16, despite fuel prices falling by only 9%. Higher average stage length of 5% can only contribute little to improved fuel consumption. However, tankering and uplifting fuel from stations with low sales tax on fuel may explain a part of the lower fuel expenses. Sales tax at Vishakhapatnam is just 1%, Goa 12.5%, Guwahati 22%, Imphal 20%, and Delhi 20%. Delhi, Guwahati, Imphal and Vishakhapatnam operations, and increased operations to Goa in Q2’16 may have significantly contributed to the drop in fuel costs. Inexplicably, the staff costs have dropped in Q2’16 compared to Q1’16, from INR 31 crore to INR 29 crore. While there is no obvious explanation for such a drop, it has resulted in the unit staff costs to drop by 41% in Q2’16. Unit maintenance costs have increased by 2% in Q2’16. Due to longer flights, capacity has increased by 56% but flights by only 50%, in Q2’16 compared to Q1’16 resulting in the 7% drop in unit user charges and related expenses, which are largely a per-flight expense. Unit lease expenses have dropped significantly by 29% in Q2’16, attributable to increased aircraft utilisation, higher capacity and no aircraft having to remain on ground in Q2’16. Average lease rental per aircraft per month is INR 2 crore. Other operating expenses, most of which are fixed, have been diluted by the higher capacity, dropping by 25% in Q2’16. Other Income, which is treated as part of operations by AirAsia India, increased by 10%, positively impacting the bottom line. The cumulative effect of increasing frequency, network changes, and increased aircraft utilisation, amongst others, has reduced unit total operational costs at AirAsia India by 21% (including other income which can also be a negative quantity as in Q4’15). This is a brilliant performance, though the drop in staff costs is yet to be clearly identified. One explanation is perhaps the reduction in training expenses due to stagnation of fleet growth, and perhaps the voluntary exit of certain crew. In Q2’16, AirAsia India realised a per-passenger cost of INR 4,621, which is 10% lower than the INR 5,166 cost per passenger in Q1’16, but 15% higher than the INR 4,009 cost per passenger in Q4’15. In Q1’16, AirAsia India incurred a loss of INR 1,469 per passenger. At the same unit passenger revenue of INR 3,154, AirAsia India would have needed a break-even load factor of 112%. AirAsia India lost INR 1.04 per seat flown every kilometer, which is 5% lower than INR 1.09/seat-km in Q1’16, but 30% higher than the unit loss incurred in Q4’15. 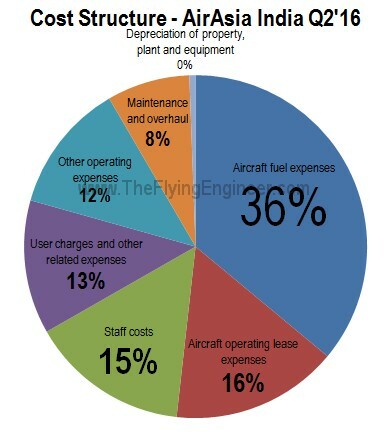 AirAsia India’s cost structure is depicted in the pie chart. Fuel constitutes 36% of the airline’s expenses. Only 6 flights were cancelled by AirAsia India, in Q2’16. The airline operated 3,032 flights, with an average on time performance (OTP) of 87%. In Q3’16, AirAsia India inducted its 6th aircraft into operations, in the second half of November 2015. Daily flights have gone upto 40, with increase in frequencies and the inauguration of a new route, Delhi – Vishakhapatnam. Quarter’s Load factors to increase to around 85%. Capacity to increase by 12% and passengers carried (including no shows) to touch around 520,000. Average unit passenger revenue may rise by around 20%+ compared to Q2’16. Certain unit costs to slightly increase due to addition of 6th aircraft and sending one aircraft for half a month for scheduled heavy maintenance. Certain unit costs to very slightly increase due to weather related delays and diversions. Ancillary Revenue percentage to drop in light of higher average fare. Very slim chance of an operational break-even. More likely in Q1’17 (April – June 2016). SpiceJet posted its third straight quarter of net profits, with the announcement of its Q2 results. The airline posted a net profit of INR 23.77 crore, but realised an operational loss of INR 27.91 crore. This loss includes the depreciation and amortisation expense of INR 30.36 crore. The airline has immensely benefitted from lower unit fuel costs which have dropped by 35% to INR 1.17/seat-km, compared to the same quarter last year. Higher load factors at the airline have driven up unit revenues by 7% over the same quarter last year. In Q2’15, the airline had an average sale (including ancillary revenue, which includes non-passenger revenue such as cargo) of INR 4,019 per passenger. In Q2’16, the airline had an average net sake of INR 3,750 per passenger. Although the airline was able to extract lesser per passenger, it flew more passengers, with the net effect being positive on the revenues. Cargo performance has however been disappointing, with the airline flying on average 140kg lesser, per flight, in Q2’16 compared to Q2’15. This has resulted in a 7% drop in cargo carried per ASK. This however is partly explained by the shrinkage of the mainline jet fleet at SpiceJet. Higher passengers, lower per-passenger sales, and lower cargo have resulted in a net 9% higher unit sales. On the operating expense front, SpiceJet performed worse (on a unit basis) than the same quarter last year. The graph clearly shows that all unit costs have gone up, except for fuel, lease rentals, and aircraft redelivery expenses. Average fuel prices in Q2’16 was 34% lower than in Q2’15. This has resulted in Spicejet’s unit fuelc osts falling by 35% (The 1% difference is due to the dissimilar fleet mix of Jets and Turboprops). Unit lease rentals have gone down due to a smaller fleet of mainline jets, and a higher utilisation of aircraft. In Q2’15, the airline re-delivered a large number of dry-leased Boeing 737s, which cost the airline much. In Q2’16, there were no re-deliveries of dry-leased aircraft, which has led to lower redelivery expenses. All other unit costs are much higher, most notably due to the smaller scale of operations which has concentrated certain fixed costs. In Q2’16, the airline deployed 34% lesser capacity than in Q2’15. Yet, all these unit cost increases were offset by the drop in fuel prices. In Q2’15, SpiceJet lost 69 paisa for every seat flown every kilometre. In Q2’16, SpiceJet lost 10 paisa for every seat flown every kilometre. However, the unit EBITDA (Earnings before Interest, Taxes, Depreciation and Amortisation) in Q2’16 was INR 0.01/seat-km, which was an earning of INR 1 paisa for every seat flown every kilometre. What pushed the quarter to profits? “Other Income” of INR 72.7 crore, which included 65.4 crore “consequent to finalisation / revision of terms of settlement of earlier lease terminations with an aircraft lessor for three aircraft” tipped the airline into net profits. Q2’15 and Q2’16 are a year apart. In that one year gap, the airline went througha near-death experience and changed hands, making the usefulness of such a comparison limited. A comparison with Q1’16 allows for a better understanding of how things are shaping up at SpiceJet. Average load factors in Q2’16 were higher than in Q1’16, despite Q1 historically being a season of peak travel demand, while Q2 is historically a lean season. In Q2’16, compared to Q1’16, SpiceJet flew 5% more flights, carried 5% more passengers, yet carried 10% more cargo, resulting in 5% more cargo per flight. The airline carried on the same number of average passengers per flight : 121, in both quarters. However, the airline operated flight lengths that were 2% lower than in Q1. Unit revenues were understandably lower in Q2 due to lower pricing power. Net sales per passenger dropped from INR 4,215 to INR 3,750, which resulted in a 8% drop in unit revenues. On the cost front, fuel prices on average in Q2 had fallen by 9%, but resulted in just 8% unit fuel savings at SpiceJet due to the shorter flights. Lease rentals have perhaps gone up due to the wet leased A319 aircraft contributing to smaller capacity per flight, and the mainline fleet growing in size with no significant change in capacity. This is due to some aircraft going for scheduled maintenance in this period, which has also driven up maintenance costs. The US dollar being higher by 3% in Q2 over Q1 may have also added to the increased expense. However, airport charges have remained almost unchanged. Q2’s higher capacity of 2% brought down employee unit costs by 2%. Other operating costs and other expenses going up by 27% and 9% respectively cannot be easily explained. Other operating costs were expected to remain the same, while other expenses were expected to fall by around 2%. The increase may be partly explained by increased selling costs (higher agent commissions – which may also explain the higher load factors), increased marketing spend, and training, among others. The airline has done something that has attracted higher expenses in Q2. In an interesting observation, IndiGo’s load factors for Q2 FY2014-15 were found to be consistently below the average domestic load factors for the first time in its entire operational history. The chart above (click to expand) captures IndiGo’s domestic load factors as reported to the DGCA. Plotting this against the average domestic load factors reveals 13 months out of 98 when the load factors of IndiGo have dipped below the average. Most of these below-average loads were in the first seven months of operations at IndiGo. In the last six financial years – the same years when the airline has been reporting profits – this has occurred just thrice. However, in this financial year alone, it has occurred thrice – in Q2 FY’15. It what appears a challenge of supremacy, SpiceJet’s market stimulation was able to distort usual market dynamics in the lean season. For instance, September, which is historically – from the last three years – the weakest month for domestic travel as indicated through the lowest load factors – has this year matched the load factors as seen in May 2014. While demand still remained low, the market stimulation drive created demand, at the expense of yields but to the benefit of RASK – revenue per available seat kilometer. While SpiceJet brainchilded and executed this, not every airline could follow its footsteps. IndiGo was unable to match SpiceJet’s market stimulation effects, which positively impacted SpiceJet in Q2, and positively impacted other airlines as well. IndiGo’s load factors also rose in sync with the average domestic load factors, but however, underperformed with below average loads. Indigo, by following what SpiceJet did, salvaged its September. However, its loads in July and August this year were lower than its loads in the same months the previous year. This performance explains in part the Q2 loss of 100Cr incurred at IndiGo. In short, market stimulation both surprised and helped the blue airline. India didn’t seem ready for a taste of South East Asian proven low cost strategy. At the same time, IndiGo is ready to make a killing in the months of November and December, lapping up the excess demand due to SpiceJet’s cancellations and planned temporary capacity reduction. SpiceJet stimulated the market with great effort, only to hand it on a platter to IndiGo in the peak season. IndiGo, the airline known to consistently post annual profits, realised a net loss of INR 100Cr in Q2 FY2014-15, covering the months of July, August and September (see footnote). In this period, the airline added a capacity of 15%, compared to Q2’14, but flew 21% more passengers – a total of 5.7 Million. The airline ended Q2’15 with 10 aircraft more than Q2’14, with the fleet strength standing at 82 as of September 30th 2015. This is an increase of 14% in fleet strength compared to Q2’14. The disproportionately higher increase in capacity compared to fleet increase is explained through a 3% increase in average aircraft utilisation, up to an average of around 11.5hrs in Q2’15. The increase in passengers in Q2 is partly due to an increase in capacity, and partly due to market stimulation efforts that IndiGo adopted, to keep up with SpiceJet’s initiatives. On April 4th, IndiGo launched fares between INR 1,499 and 2,199 for travel between 1st July 2014 and 30th September 2014. The period of travel was exclusively in Q2’15. This was followed by few other promos, most of which were for travel in September 2015. This resulted in September recording the highest growth in passenger, Year-on-Year, as seen in the graph below. IndiGo’s capacity increased in the three months of Q2: July, August and September. However, compared to Q2’14, the number of passengers per ASK dropped in July, picked up in August, and shot up in September due to numerous sales that targeted September: historically the weakest month for domestic travel. The airline’s cargo performance recorded a growth in July and September. The increase is partly due to the fact that IndiGo has started carrying mail in addition to freight, since May 2014. Average flight hours per departure have reduced, indicating on average shorter flights flown by the airline, due to increase in domestic flights. International flights, which comprised 6.6% of all flights in Q2’14, has halved to 3.4% in Q2’15, indicating a strengthening on the domestic front and a reduction on the international front (International flights dropped by almost 40%). However, a lack of vigour and success in market stimulation may have been responsible for the domestic load factors (LF) of the airline to consistently trail the average domestic load factors (see graph above). It may be possible that since IndiGo responded to sales, especially those by stimulation leader SpiceJet, but didn’t initiate them, the efficacy of the sales drives may have been severely limited (a lot of planning and analysis goes into each sale. Responding to others may rob the respondent the time to perform sufficient due diligence). See the comparison between SpiceJet’s and IndiGo’s load factors, below – IndiGo can do a lot better. This could have had an adverse impact on the airline’s RASK (Revenue per available seat kilometre). We consider only the domestic LF, as International forms just 11% of the airline’s deployed capacity. Interestingly, Rakesh Gangwal and Sanjiv Kapoor have both earned a Master of Business Administration degree from the Wharton School of Business of the University of Pennsylvania. However, a true low cost airline experience (and proven market stimulation strategy) is brought to the table by SpiceJet CCO Kaneswaran Avili. His experience at AirAsia and Tigerair have resulted in the graph below. A comparison with SpiceJet becomes inevitable – the two largest low cost carriers with seemingly different strategies today. Sources within IndiGo reveal that the airline’s CASK (cost per available seat kilometre) is at around INR 3.6. 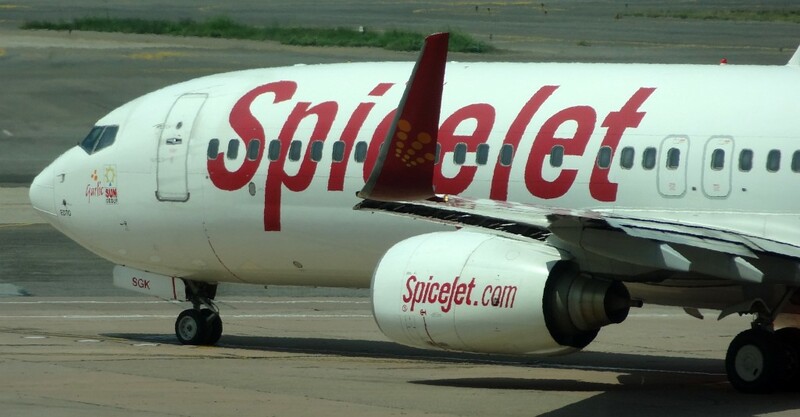 Compared to its next biggest LCC competitor – SpiceJet’s CASK of INR 4.07, this is INR 47 paise lower. 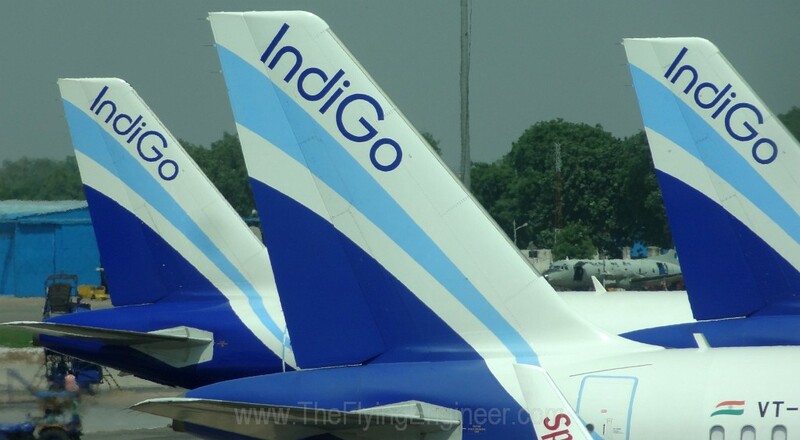 IndiGo lost INR 175 for every passenger flown in Q2. The CASK at IndiGo seems to be INR 3.6, and the RASK for Q2 may hover around INR 3.4-3.5. This may be higher than SpiceJet’s Q2 RASK of INR 3.26, which was impacted by cancellations and clubbing of flights. One – where IndiGo could have stimulated the market like SpiceJet. An aggressive market stimulation may have narrowed the loss for IndiGo, or it could have perhaps reported a profit. The airline could have flown fuller airplanes (in the light of its disappointing load factors) and brought in more revenue, resulting in a higher RASK. SpiceJet in 2014-15 is undoubtedly the Indian market leader in stimulation. IndiGo on the other hand didn’t respond too well to this. It will be interesting if this figures in their next year’s strategy. Two: Where SpiceJet could have had the CASK that IndiGo enjoys. If SpiceJet’s CASK was INR 3.6 against its INR 4.07, its loss would have narrowed to around just INR 120Cr. Despite its high RASK, SpiceJet was able to salvage the situation to a level where the loss was arrested at INR 310Cr. If IndiGo starts behaving like a true low cost carrier, perhaps emulating, and not merely responding to the kind of market stimulation that SpiceJet was able to execute, it may become an untouchable. The only way for other airlines to survive will be through differentiation: Vistara as full service, with favourable connections to the world through Singapore; Jet as a full service, with favourable connections to the world through the middle least; and SpiceJet through its well differentiated in flight services and Tier II/III connectivity. AirAsia and GoAir may face the highest heat as they yet do not have an offering that IndiGo doesn’t. While AirAsia may have the backing to grow to a scale to take on IndiGo with scale and lower costs, GoAir will be the loner. A strategy that IndiGo seems to be applying is market dominance through excess capacity, frequency and network. The airline, however, is yet to make the most of its ‘overcapacity’. 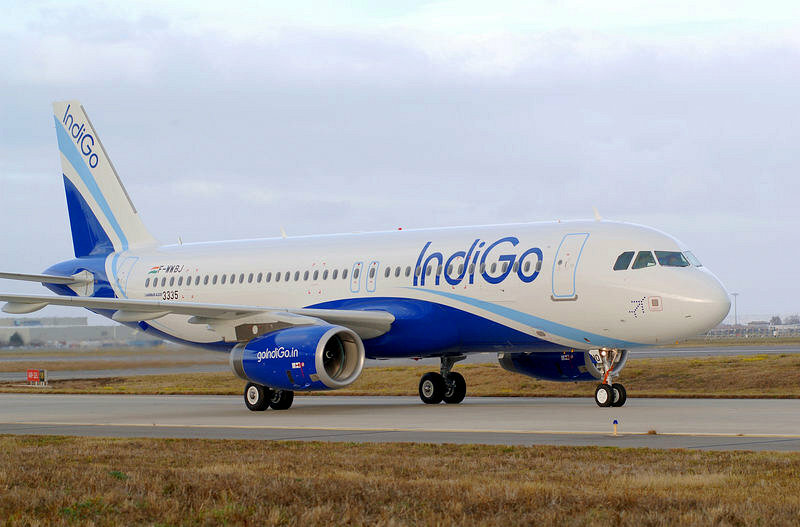 IndiGo received its 100th aircraft on the 3rd of November, 2014, completing an order that was placed in 2005. With this 100th aircraft, the fleet size rose to 84 (16 A320s were sent off as per the old lease contract that lasted six years). To fill the gap between November and last next year – when its NEOs from its second, 180 aircraft order placed in 2011, are expected to be delivered, IndiGo has ‘short term’ leased around 12 Airbus A320 aircraft used by Tigerair or its now defunct subsidiary at Indonesia – Tigerair Mandala. The first aircraft, a non-sharklet A320 that flew at Indonesia, joined IndiGo’s fleet on 21st November as VT-IDB. IndiGo today (26th Nov 14) announced Kozikhode as its newest, 37th destination, which will be connected 2nd January onwards. With this, the airline’s daily flight count will rise to 554. Footnote: Source of loss: Airline internal sources. AirAsia India completed its first full quarter of operations. The airline, which took off on June 12th 2014, carried 128,089 passengers in 946 flights to 5 destinations, in the Q2 period. It posted a net loss of approximately INR 29 Crore. The airline had had an interesting performance. To know more about how it performed, and get a glimpse on the outlook of the airline, click here: AirAsia India – Q2FY15 performance and outlook. SpiceJet’s COO Sanjiv Kapoor conducted a class on introductory airline economics. He also dived, to some depth, into the Q2 results, and shared views on the airline’s performance. The Flying Engineer also did his homework, and analyses, together with what was said in the class, SpiceJet’s performance. Also talked about is a bit beyond Q2: October. Load factors at the airline dipped. In November, the airline’s fleet size has shrunk. The why, and what next of these and more, here: Q2 results and Prof. Sanjiv Kapoor’s introductory class on Airline Economics. SpiceJet is a unique airline. The airline had a massive management reshuffle, and the new management is actually working hard – very hard towards turning around the airline. In a record period – of around nine months, the airline has actually effected so many changes that it is an all new SpiceJet – in terms of appeal, service, and performance indicators. Symbolically, its the phoenix of the Indian airline industry. Load factors, one of the strongest indicators of revenue, have been consistently up in the airline from the last few months. In Q2 FY2014-15 – comprising the months July, August and September, the airline recorded the airline industry’s highest ever domestic load factor in recent history, of 85.9%. What makes this achievement more remarkable is the fact that it was achieved in a lean season. The average Q2 domestic load factor stands at 82.5% – the best performance in the last 15 quarters of SpiceJet, and the highest among all Q2s in the entire history of SpiceJet. Yet, the Q2 results will report a loss, and profitability in Q3 is somewhat threatened. The market stimulation, and ancillary revenues have brought SpiceJet impressive revenues, but unfortunately these revenues are overshadowed by high costs in the airline. The high cost structure at SpiceJet – higher than the other two prominent LCCs – IndiGo and Go Air, is due to funding issues. The airline, which is now finding it difficult to sustain purely on cash flows from advance sales, badly needs a fund infusion. 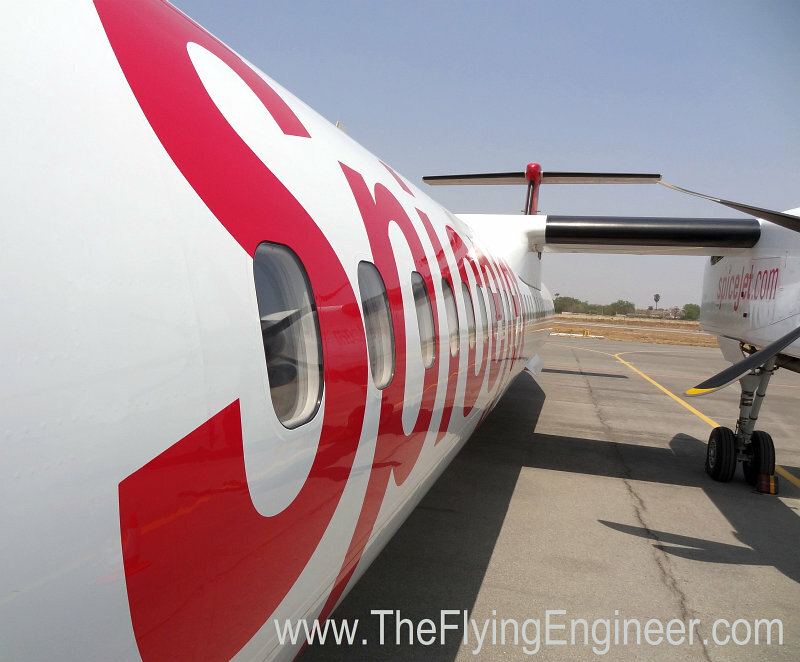 Without a cash problem, SpiceJet can make more money, and lower costs. How? Find out about this, and more, in further detail through our analysis, by clicking here. This post briefly compares SpiceJet and IndiGo, and talks of SpiceJet’s financial performance and cost breakup, the Q400 woes, the airline’s route and fleet expansion between end Q2 12 and end Q2 13, the new COO, and also: graphically showing the ATF price trend in India. SpiceJet, which commenced operations in 2005, is unique. It’s a low cost carrier that flies to 55 destinations (45 Domestic and 10 International), has a dual fleet of 55 airplanes : Boeing 737NG (Boeing 737-800 and Boeing 737-900s), and the turboprop Q400: The only operator of the type in Middle East, South and South East Asia. The 737s have a good market resale value, while Q400s are not in demand. Its 737 fleet has ovens on board, some of its airplanes could be cleaner, and its ground vehicles could be parked better. All its Q400s are fully owned, and the airline is gradually moving away from 737 ownership to leased airplanes. It has mulled a narrow body jet fleet switch to Airbus A320NEOs, and is presently without a CEO since Neil Mills left the airline and went to Philippine Airlines. Spicejet posted the worst ever Q2 loss, ending September 2013, of INR 559 Crores (INR 5.59 Billion), and reported a reported a loss of INR191 Crore during 2012-13 (INR 1.91 Billion). Since the Jan of 2013, till September end 2013, the airline has flown on domestic(international) routes 8.6Million(0.7Million) passengers on 82,569(6,216) flights, and has experienced its best load factor of 81%(78%) in the month of May(June), and 68%(69%), its worst in the month of September(July). Over this 9 month period, the airline had an average load factor of 74.7% (74.2%). IndiGo, which commenced operations in 2006, is very unique. It’s a low cost carrier that flies to 35 destinations (30 Domestic and 5 International), has a single fleet of 71 airplanes : Airbus A320 airplanes only (not even A319s and A321s): The only operator of a single type and single variant fleet in the country. The A320s have the highest market resale value. Its airplanes have no ovens on board, all its airplanes are clean, and its ground vehicles parked in an organised manner. All its airplanes are leased through a profitable sale-leaseback practice. As part of natural fleet expansion, it has ordered Airbus A320NEOs, and is presently with the same, apparently satisfied CEO since 2008: Aditya Ghosh. Indigo reported a profit of INR 787 Crore (INR 7.87 Billion) during 2012-2013. 2012-2013 was its 5th consecutive year of profits. Since the Jan of 2013, till September end 2013, the airline has flown on domestic(international) routes 13.2 Million (1.1 Million) passengers on 103,439 flights, and has experienced its best load factor of 90%(88.9%) in the month of May(Jan), and 70.3%(73.3%), its worst, in the month of September. Over this 9 month period, the airline had an average load factor of 80%(82.8%). And yes, SpiceJet is publicly listed, and IndiGo isn’t. The financial quarter ending September was very challenging for SpiceJet, as for other airlines. Statistically, the months of July, August and September witness a lower domestic demand. Adding to its troubles was the weak rupee, rising fuel prices, increased maintenance costs due to “bunching up of engines sent for shop visits”, the start up costs associated with two new destinations: Muscat and Bangkok, and, as per airline insiders, an operationally troublesome Q400 that lead to a recent cancellation of many flights in October. The aircraft, according to one captain, isn’t probably suited for Indian conditions, but “maintenance could do better”. Few maintenance personnel feel internal issues in the airline management are partly responsible for the Q400s maintenance and operational reliability that “can actually be better”. Some in the airline believe that the Q400s are “wretched aircraft”. In the December of 2010, Bombardier announced that SpiceJet had placed a firm order for 15 Q400s, with an option for another 15. Exercising the option for the other 15 hasn’t yet happened, and very likely, won’t. Operational costs in the airline have understandably increased, with SpiceJet’s addition of almost 22 new routes, and addition of 8 Boeing 737-800s and 3 Q400s to its fleet, between October 2012 and September end, 2013. Despite this, and the increased fuel prices, fuel costs haven’t increased much. Maintenance, and depreciation and amortisation expenses have been the most significant increases compared to the same period last year, which has had the effect of reducing the fuel cost’s share in the airline’s expenses. Question is, are the dual fleet and aggressive route expansion helping the airline? Or is something more needed? On November 1st, Sanjiv Kapoor joined the SpiceJet as the Chief Operating Officer. Sanjiv started his airline experience with Northwest in 1996, where his role spanned across corporate finance, business planning, procurement and operations. He later joined a world renowned consulting firm, leading their business that caters to airline consultancy. He’s been an advisor to a Bangladeshi airline, as well. How Mr. Sanjiv helps transform the airline is to be seen. But that also depends on how much the airline allows him to implement changes. Truth be told, unless the top management steps out onto the apron and spends days with operations, many decisions may be based what may not be reflective of ground reality. And it’s on the ground, that most issues are seen, as felt by many of the airline’s staff.